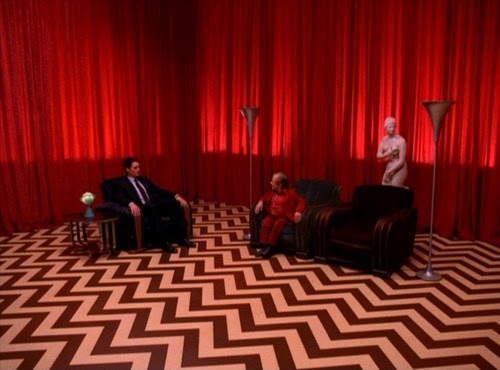 Home » abc , david lynch , television , twin peaks » David Lynch is shooting new TWIN PEAKS material. For real. David Lynch is shooting new TWIN PEAKS material. For real. "Diane, 11:30 AM, February 24th. Entering the town of Twin Peaks. It's 5 miles south of the Canadian border, 12 miles west of the state line. Never seen so many trees in my life. As W.C. Fields would say, 'I'd rather be here than Philadelphia.'" ".ria eht ni cisum syawla s’ereht dna gnos ytterp a gnis sdirb eht, morf er’ew erehW"
David Lynch is producing and directing new footage for Twin Peaks. In retrospect it is very difficult to argue with the impact that this series had, however brief it lasted. Had there been no Twin Peaks, there would have been no Lost. There probably would have never been a revived Battlestar Galactica. A lot of series would never have been conceived much less taken root had Twin Peaks not broken the ground first. Premiering on ABC in April of 1990, Twin Peaks was something that television had never seen before and nearly a quarter century later is still trying to figure out. Part murder mystery, part soap opera... and all surreal as only the mind of David Lynch could evoke. The death of Laura Palmer was just the beginning, as Special Agent Dale Cooper - and the rest of us - descended into the logging town of Twin Peaks, Washington: a place where nothing was ordinary. A place where everyone had a secret. A place where... "the owls are not what they seem". I used to own every bit of Twin Peaks merchandise there was. I even still have the soundtrack CD here somewhere. Angelo Badalamenti's score alone made this show haunting like nothing before or since. The chronology of the series took place in 1989. The Little Man from Another Place told Cooper that he would see him again "in twenty-five years". That would be this year: 2014. Maybe it will wrap up some of the lingering mysteries left from the show's final episode. One chants out between two worlds. Fire, walk with me. If David Lynch can finish Twin Peaks finally, what if Ronald D. Moore got to finish Carnivale on HBO. So glad that someone else thinks that HBO should bring back Carnivale! It would be perfect timing too. Seasons 1 and 2/Book 1 were in 1933 and Seasons 3-4/Book 2 were to be set in 1939-1940. It would have been seasons 5 and 6 that would be in 1945.